SnapNrack Universal Roof Mount Kits include black or clear anodized rail, Universal End Clamps (UEC), midclamps, and black rail end caps so they are suitable for use with black- and clear-framed modules. The Universal End Clamp slips beneath the bottom glange of the modle frame; one size fits virtually all modules with frame depth greater than 1.3". Secured out of sight beneath the modules, the UECs lend a smooth, finished look to the array. Module quantities in the table below are applicable for modules listed in this catalog, as well as any other brand of modules with a width of 39.5" or less. 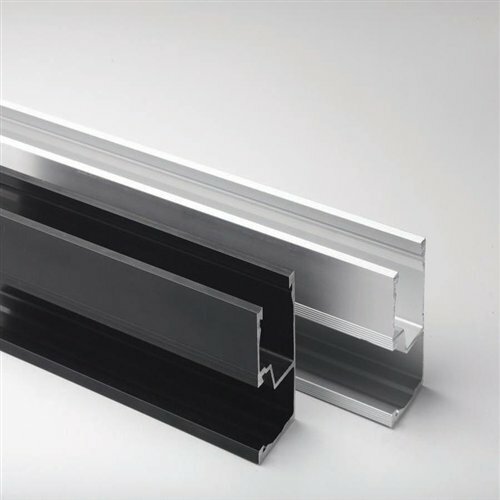 Aluminum rails may be cut to length as needed. Roof attachment parts are sold separately and depend on the type of roof to which the mounting structure will be secured. Grounding Kits These SnapNrack Grounding Kits match up with the roof mounting kits and come with all the grounding hardware needed for each rack. The WEEB kits include the WEEB washers, any splice jumpers needed, and two rail lugs. The lay-in lug kits include enough lugs for each module and piece of rail. Ground wire is not included. Use the kit needed to meet module and inspector requirements.